For centuries, there has been something spiritual about travelling to Mount Fuji, Japan’s iconic volcano. Traditional Japanese faith said that Mount Fuji was a female goddess who was much like a mother. Most of the time she looked after her children, giving them water and fertile soil. But every so often she got angry and… well, erupted! With any god – but especially one that would burst into lava and toxic gases every 300 years or so – it is important to show your respect. With Mount Fuji, this has always come in two ways. Firstly, there is the climbing. For as long as Japanese history can be traced, people have trekked to the top of Mount Fuji. Historically, this was a pilgrimage – both a tribute to the gods and a personal journey. They used to walk from Kyoto when it was the capital of Japan. When the capital moved to Tokyo, they walked from there. The pilgrimage from Tokyo to the top of Mount Fuji and back took about eight days. But, secondly, there was the worship of the mountain. Although many people believed Mount Fuji itself was a goddess, there were also strands of faith that believed it was home to many other gods – and even a link to the underworld. And so all along the approach to the summit of the volcano are temples and shrines that locals would pray at and the pilgrims would stop to worship at along their journey. These days there are still pilgrims… in a sense. Thousands of people come to climb Mount Fuji and each has their own reason for doing it. For many, it’s just fun. For others, it is part of a deeper inner journey. But there are only a few who still do it for religious reasons. I don’t think that’s a problem. A pilgrimage means something different to every person and it’s no easy feat to climb to the summit of a volcano. The round trip may only take 8 hours, rather than 8 days, but it’s still an achievement. But I do worry that maybe a lot of the people who climb Mount Fuji – or even just visit the area without going to the summit – aren’t aware of the historic and religious significance here. Taking some time to see the sites of worship that have existed here for centuries offers a deeper understanding of the region. It gives more context to why this towering volcano is more than just a scenic mountain, and is such an important part of the spirituality of Japan. These religious buildings and other sacred sites around Mount Fuji are so important that, together, they were added to the UNESCO World Heritage List in 2013. There are 25 individual locations that are part of the designation. They include shrines, historic lodging houses, lava moulds, and sacred natural spots like lakes that were used for purification by pilgrims. If you’re interested, I’ve put together this map that shows you where they all are. You’ll notice that a lot of the sites are on the northern side of Mount Fuji. That’s because this is where the pilgrims would arrive from Tokyo. However, the oldest and most significant sites on the south because that’s where the original pilgrims from Kyoto would come. 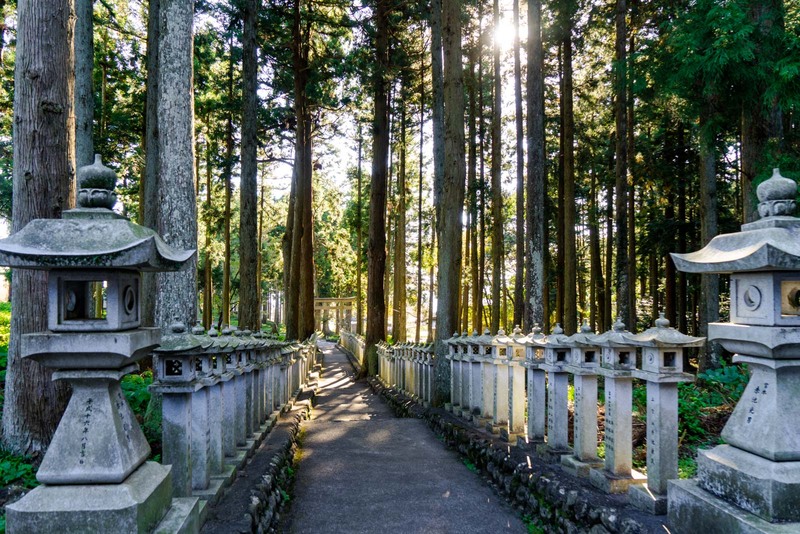 Basing yourself in the city of Fujinomiya is the perfect way to explore the World Heritage locations on this side of the mountain. It also gives you access to the shortest hiking route to the top of Mount Fuji and an easy way to do some trekking from the 5th station in the off-season when the summit is closed. Here’s a selection of the best parts of the World Heritage Site that are worth seeing around Fujinomiya. There’s no doubt that this is the most important shrine in the region and the head shrine for all the other Sengen places of worship you’ll find in Japan. It was more than 1000 years as a place to pray for protection from eruptions but the current design is from the 1600s. A few of the buildings are original and other have been repaired after natural disasters. The main shrine building is brightly-coloured and sits in the middle of a beautiful courtyard. If you head out to the right, you’ll find a pond used for purification. The shrine was considered to be the ‘front entrance’ to Mount Fuji and a lot of the pilgrimages began their sacred final climb from here. I think the layout of this shrine is so beautiful and it’s completely different to any others you’ll see. It’s worth making the effort to visit because you won’t find anything else like it. What makes it so special is that it doesn’t actually have a main hall here. You enter on a long pathway lined with stone lanterns on either side. At the end is a staircase up to an elevated level. 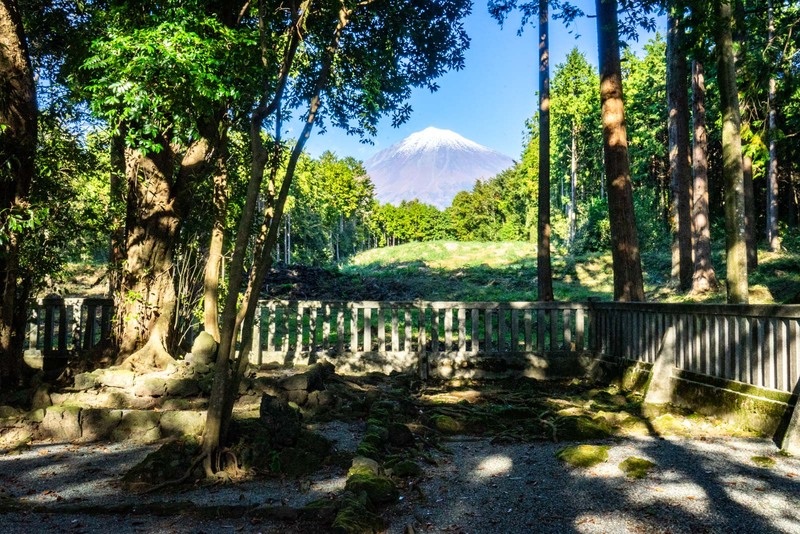 Up on this level are some of the items you may expect to find in the hall of a shrine but right in front of you is the main attraction – a clear view right to Mount Fuji that you can worship directly from this spot outside, surrounded by trees. This is another very important site in the story of pilgrimages to the volcano. It’s said that the founder of one of the most important Fuji-worship groups underwent his religious training on this spot around the 16th century. His name was Hasegawa Kakugyo and he chose this location because there’s a mouth to a lava cave here and it was thought it offered a direct connection to the mountain goddess. You can still see the cave entrance but it’s now closed to the public. Apparently it stretches back for about 100 metres. What is more interesting are all the monuments that have been erected over the centuries to pay homage to all the different Fuji-worship groups that have come through here on their way to the summit. And finally, you can’t visit Fujinomiya and not go to see Shiraito Falls. I would say they are the second most impressive sight in the region – after Mount Fuji, obviously. They are only about 20 metres high but the impressive thing is the cascade of the falls is about 150 metres wide, like a widescreen that is impossible to capture in just one frame. The name refers to hanging threads of silk, which is just what Shiraito Falls looks like. The falls are part of the World Heritage Site because they were considered sacred by the cults of pilgrims who would pass through. The water comes directly from the snow on Mount Fuji but can take more than ten years to seep through the ground from the summit to here! Whether you come to Mount Fuji for the climb or the history, it would be a shame to not see some of these beautiful and significant sights. And staying south of the mountain, in Fujinomiya, gives you the perfect base for all your exploration! Time Travel Turtle was supported by Fujinomiya City but the opinions, over-written descriptions and bad jokes are his own.